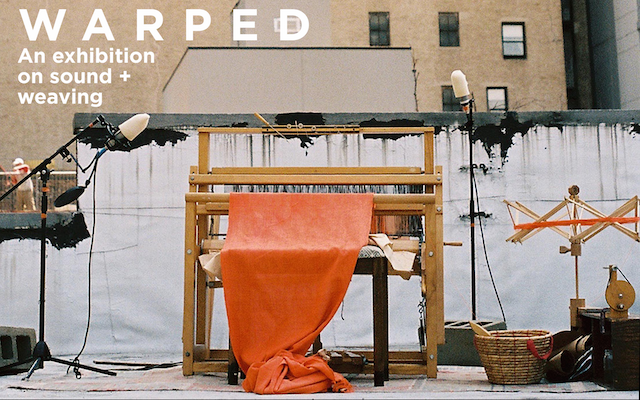 The Center for Craft, Creativity & Design's (CCCD) Benchspace Gallery & Workshop announces its summer exhibition, WARPED, featuring six internationally based textile artists exploring connections between sound and weaving. "WARPED brings together an innovative selection of art works from the US and the UK." Says exhibition curator and CCCD Assistant Director Marilyn Zapf. "Asheville's thriving music scene will appreciate the groundbreaking ways these artists, designers, and composers are working at the intersection of sound and weaving." Practitioners have long observed the relationship between sound and weaving. Appalachian master weaver Lou Tate (1906-1979) remarked how the weaving draft pattern resembles the five line musical staff. Both composing and weaving are time-based endeavors that require significant planning, and are often recorded with the intention of being repeated, replayed, or replicated. The artists in the exhibition continue to investigate this intersection. Artist Alyce Santoro takes a material approach; weaving audiocassette tapes into an audible cloth. Nadia-Anne Ricketts and Christy Matson work with spectrograms, or the visual representation of sound waves, in their wall hangings. Conversely, composer Chris Kincaid translates weaving techniques, drafts, and patterns into sound, creating a six-movement arrangement for strings and electronics. Finally, Alayna Rasile-Digrindakis and Raisa Kabir investigate the loom as an instrument that can be used either to silence or give voice to the maker.